remap the area of High Wycombe earmarked for town centre re-development (formerly Project Phoenix). 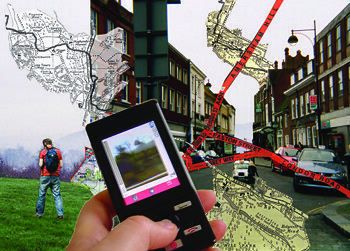 The remapping is to be undertaken in collaboration with community groups in High Wycombe by staging a psychogeograpical event, a walk, a ‘derive‘ within the boundary of the re-development area, the results of which will be used to animate the town centre with a temporary art installation. a live performance around the hills of the town. This performance which is actually a walk to link up significant sites, will be broadcast via a mobile phone video camera to a base station in the town centre. A Walker will embark on a ritualistic perambulation around the town of High Wycombe in Buckinghamshire on June 18th 2005, to link up the Significant Sites, that surround it. He will use the town's matrix of ancient footpaths to achieve a circuit. Using a video phone he will document his journey and send moving images to a base station in a prominent position in the town centre. YOU will be able to interact with him feed him with information about the sites, your own thoughts and stories about the places he passes through and suggest alternative routes. To participate, wherever you are, txt: 07986 357156 or email wycombederive@yahoo.co.uk or check out his progress on remappinghighwycombe.blogspot.com.